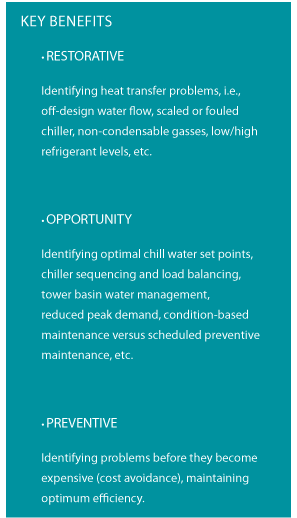 By installing state of the art software that goes beyond your standard BAS or chiller monitoring system, we are able to optimize your chiller operation and achieve a minimal 15% cost reduction. While payback times vary depending on chiller size and utilization, paybacks are often 24 months or less. That is great, but our solution runs to your parallel building automation system (BAS) and optimizes chiller operations in ways unachievable by the most advanced BAS’ put out by Siemens, Johnson Controls, Honeywell, Trane, etc. The current standard practice is to provide enough cooling capacity to meet the needs of the facility while minimizing ton hours. This is either achieved manually by experienced operators or by a BAS with operator oversight. The key to this solution is that it utilizes a combination of the full load design specifications and other data to create a Calculated Part Load Value (CPLV) kW/Ton profile, which is the foundation for cost reporting and diagnostics. The actual chiller operating data is compared against the CPLV profile to measure operating efficiency under ALL operating conditions (not just full load).